I saw an interesting problem that requires Bayes’ Theorem and some simple R programming while reading a bioinformatics textbook. I will discuss the math behind solving this problem in detail, and I will illustrate some very useful plotting functions to generate a plot from R that visualizes the solution effectively. The following question is a slightly modified version of Exercise #1.2 on Page 8 in “Biological Sequence Analysis” by Durbin, Eddy, Krogh and Mitchison. 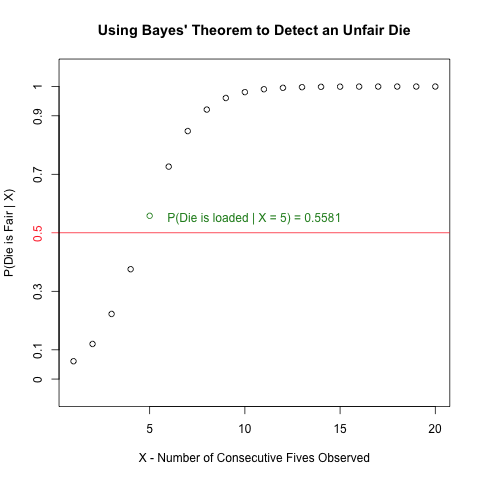 Read more to learn how to create the following plot and how it invokes Bayes’ Theorem to solve the above problem! Last week, I wrote the first post in a series on exploratory data analysis (EDA). 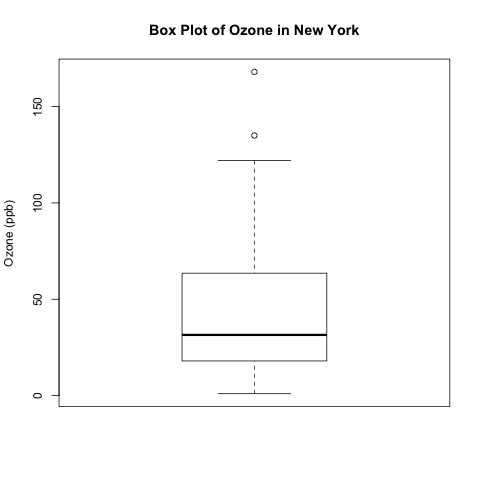 I began by calculating summary statistics on a univariate data set of ozone concentration in New York City in the built-in data set “airquality” in R. In particular, I talked about how to calculate those statistics when the data set has missing values. Today, I continue this series by creating box plots in R and showing different variations and extensions that can be added; be sure to examine the details of this post’s R code for some valuable details. I learned many of these tricks from Robert Kabacoff’s “R in Action” (2011). Robert also has a nice blog called Quick-R that I consult often. Recall that I the “Ozone” vector in the data set “airquality” has missing values. Let’s remove those missing values first before constructing the box plots. The simplest box plot can be obtained by using the basic settings in the boxplot() command. As usual, I use png() and dev.off() to print the image to a local folder on my computer. What do the different parts of this box plot mean? The Ideal Gas Law, , is a very simple yet useful relationship that describes the behaviours of many gases pretty well in many situations. 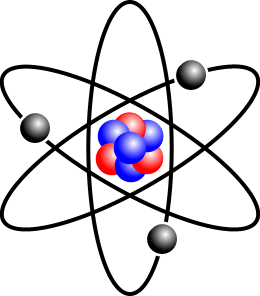 It is “Ideal” because it makes some assumptions about gas particles that make the math and the physics easy to work with; in fact, the simplicity that arises from these assumptions allows the Ideal Gas Law to be easily derived from the kinetic theory of gases. However, there are situations in which those assumptions are not valid, and, hence, the Ideal Gas Law fails. Boyle’s law is inherently a part of the Ideal Gas Law. It states that, at a given temperature, the pressure of an ideal gas is inversely proportional to its volume. Equivalently, it states the product of the pressure and the volume of an ideal gas is a constant at a given temperature. This law is valid for many gases in many situations, but consider the following data on the pressure and volume of 1.000 g of oxygen at 0 degrees Celsius. I found this data set in Chapter 5.2 of “General Chemistry” by Darrell Ebbing and Steven Gammon. The right-most column is the product of pressure and temperature, and it is not constant. However, are the differences between these values significant, or could it be due to some random variation (perhaps round-off error)? 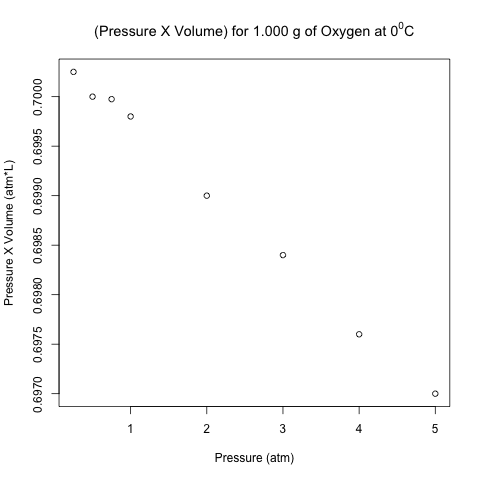 Here is the scatter plot of the pressure-volume product with respect to pressure. These points don’t look like they are on a horizontal line! Let’s analyze these data using normal linear least-squares regression in R.
A scatter plot displays the values of 2 variables for a set of data, and it is a very useful way to visualize data during exploratory data analysis, especially (though not exclusively) when you are interested in the relationship between a predictor variable and a target variable. Sometimes, such data come with categorical labels that have important meanings, and the visualization of the relationship can be enhanced when these labels are attached to the data. It is common practice to use a legend to label data that belong to a group, as I illustrated in a previous post on bar charts and pie charts. However, what if every datum has a unique label, and there are many data in the scatter plot? A legend would add unnecessary clutter in such situations. Instead, it would be useful to write the label of each datum near its point in the scatter plot. I will show how to do this in R, illustrating the code with a built-in data set called LifeCycleSavings.